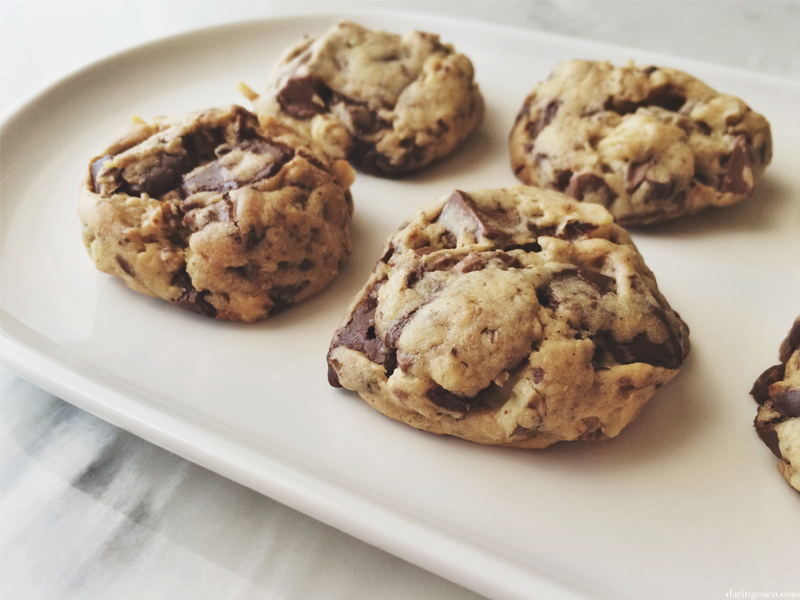 I can confidently say that these chocolate chunk cookies are truly the best chocolate chunk cookies ever. These really are the best cookies in the world, and I’d be willing to stake my life on it. 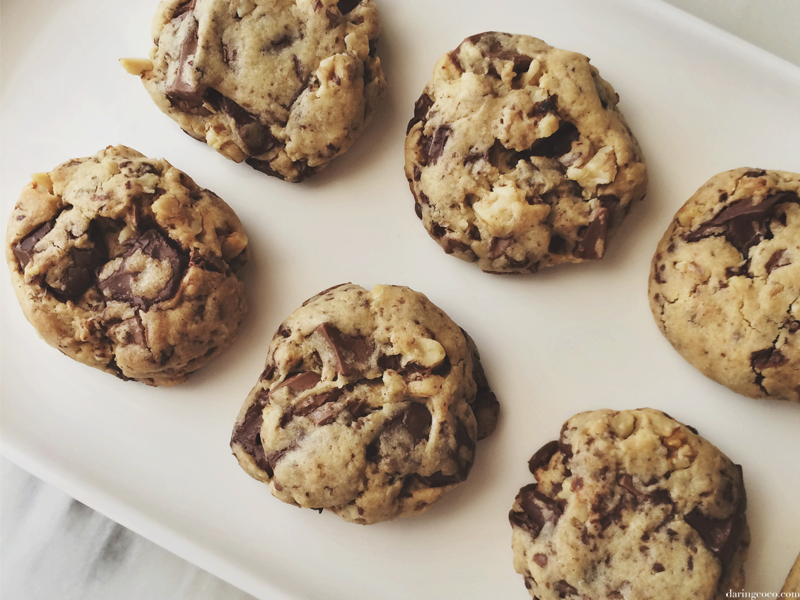 Not only are these chocolate chunk cookies the most delectable, chocolaty-chunky morsels ever, they’re also incredibly effortless to make. 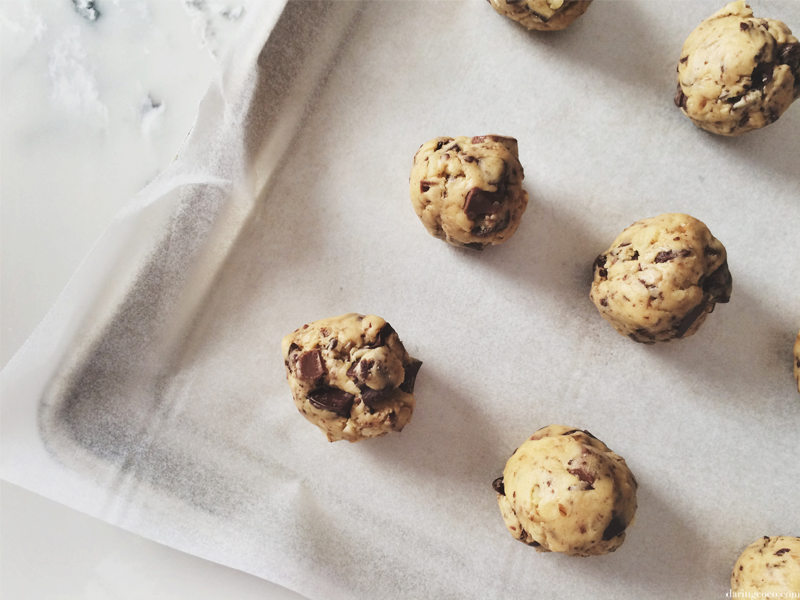 All that is required is a little mixing, then rolling and then you bake. Et voila. The only problem you may encounter is finding the discipline to stop yourself from devouring the entire tray. Especially when they’re fresh out of the oven and are at their most irresistible. That warm, molten and gooey goodness. How does one resist such temptation? The original recipe called for walnuts. And if you’re anything like myself, you would have been thinking, “ewww, walnuts”. I did contemplate substituting them for something significantly less bland and more flavourful like pecan nuts but thankfully refrained from doing so. 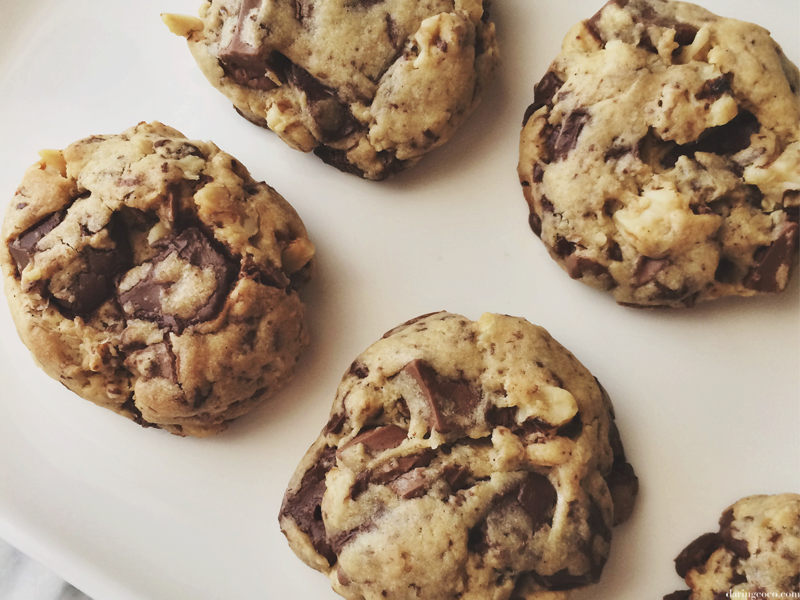 Because somehow the earthy tones of walnuts pair well in these chocolate chunk cookies. You get the crunch and texture from the nuts and all sans that awful insipidness that I associate walnuts with. Best of all they reduce the overall sweetness, making all that chocolaty goodness more prominent on your taste buds. It’s actually a perfect pairing. Who knew? That said, am I walnut convert? Definitely not. Would I consider using them again? 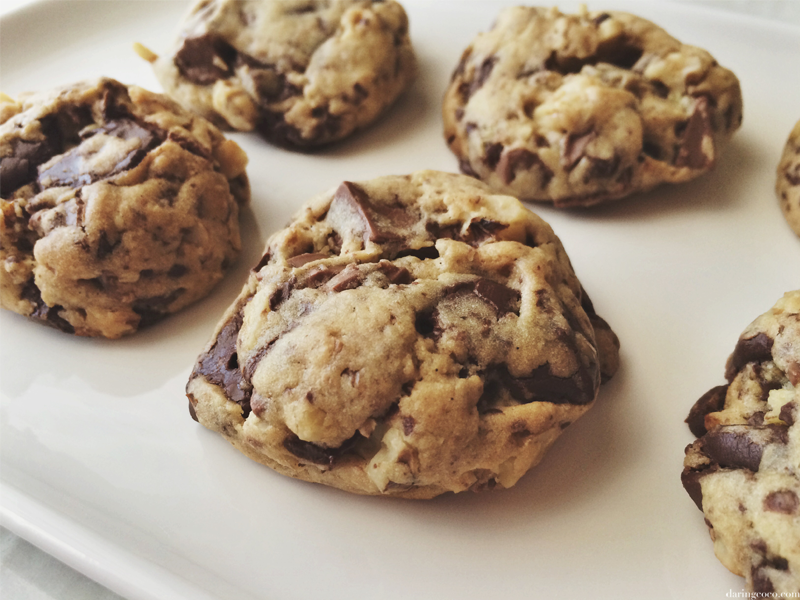 In this recipe for chocolate chunk cookies, yes. In others? Probably not. What can I say, I am stubborn when it comes to certain dislikes, especially concerning food. Preheat oven to 180°C / 356°F and line two baking trays with baking paper. Add the egg and vanilla essence and beat until thoroughly incorporated. 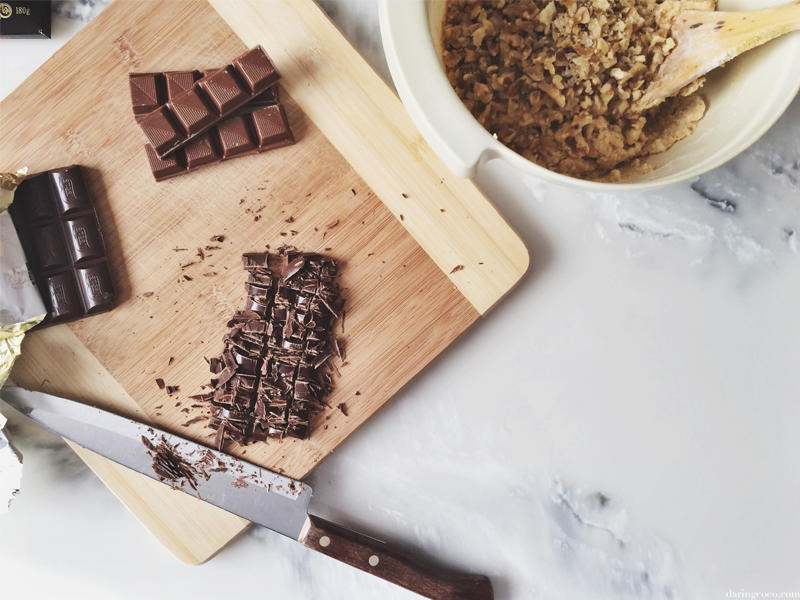 Add flour and mix well using a wooden spoon then add the chocolate and walnuts. Roll mixture into large walnut sized balls and place on the baking tray, leaving a space of 3cm between each ball. Flatten slightly with the underside of a spoon. Bake for around 20 minutes or until lightly browned.